Well, tour my YA space, anyway. I’ve been thinking a lot about the teen space lately. I’ve been working with my Teen Advisory Group (TAG) and they really want to make it cooler. Having a cool, comfy, not weird place for teens to hang out and do homework (or not do homework) is an important priority for libraries. Right now, I think that my teen area is O.K. Not too lame, not too awesome. Just somewhere in the middle. The teens do go there, but often will get a book and then bolt. It’s hard when I see them sitting in the Children’s room or hanging out in the Reference area. I want them to hang out in their space! So I’m working with the TAG to try and make some cosmetic changes to the space to make it better and working with my awesome YALSA mentor, Valerie (Hi, Valerie! ), too. I think it needs more color and more stuff going on. Take a look and I’ll take any suggestions you have! These are my chairs. They’re fine. I’m weirdly attached to the little circle tables, but I also want to paint them bright orange and teal or something. There is usually a nice, colorful display on those windows, but I just took it down. 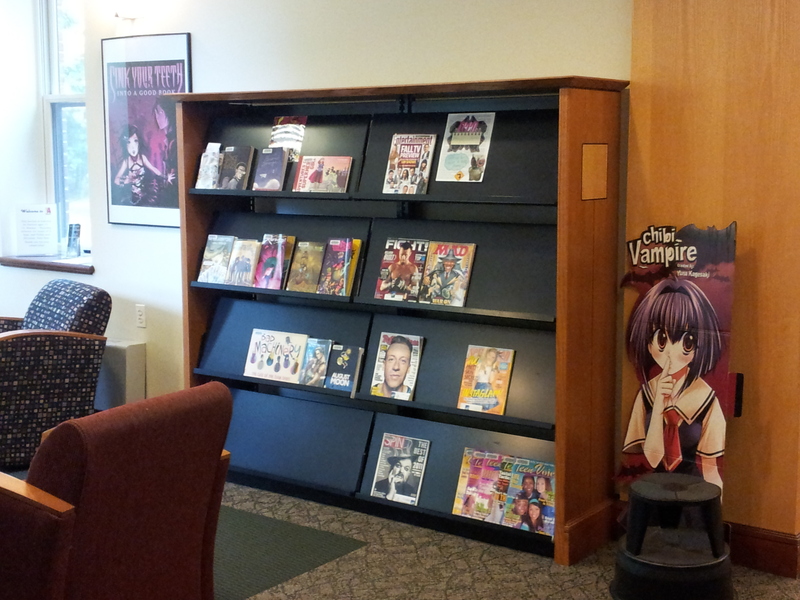 Magazines, new graphic novels, and vampire corner to the right of the chairs. Looking at my three YA shelves and out to the entrance. The circulation/reader’s services department aka “The Main Desk” is to the right. 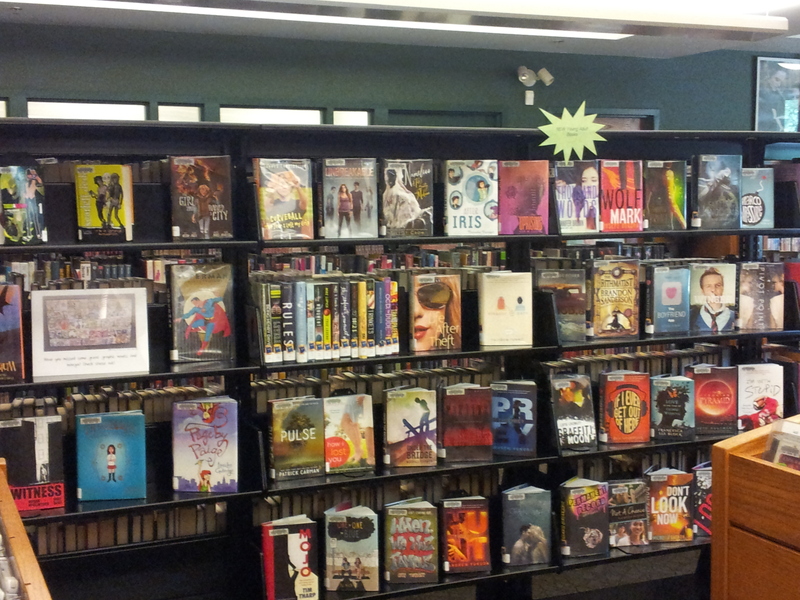 I love how convenient the YA area is to both the door and the check out. Gets in them and taking out books. P.S. If you can zoom in on the picture you can see a woman behind Princess Diana of Themyscira riding a kangaroo. Why? I have no idea. Display and new shelves. These are always fun to stock and maintain. That’s my space, or really my teens’ space. It’s great but it needs more pizzazz. Any other teen librarians out there with some ideas? I have some that I’d love to do – more signs, teen-created art, passive programming, color, just more of everything! Finally, are you NaNoWriMo-ing this year? Consider it! You too can have a slightly terrible teen zombie novel languishing on your laptop, too fearsomely bad to ever be opened again. It’s the dream people. I’m doing it again this year. Sign up here and let freshman literary badass Tupelo Hassman inspire you to make the impossible happen. Great start (also great that you have space). 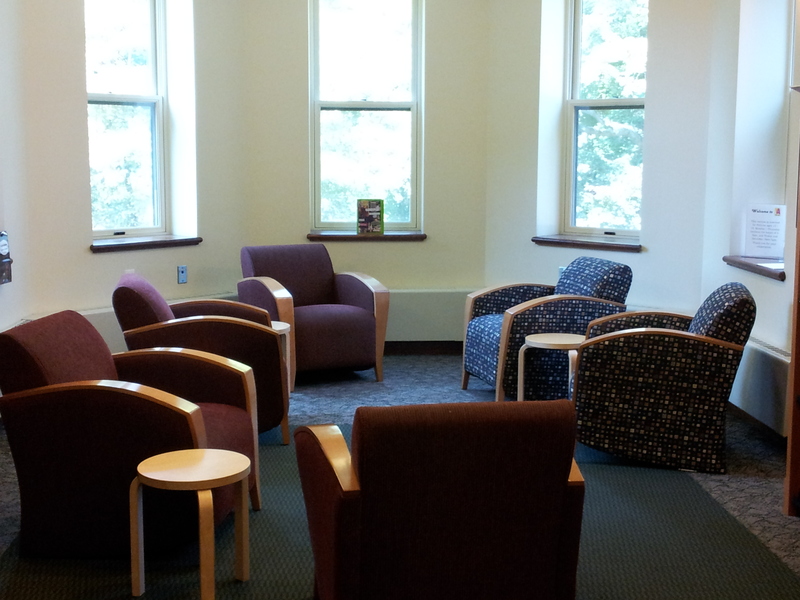 Both the Beverly/Salem libraries have teen spaces, and I think what makes them inviting to teens is that part of the space is private (ie: there’s a wall), or “hidden” alcove. I think you want to get the teens to feel that their space is their own, not to be invaded – not sure how you could make that work with your space though. If it were me, I’d consider adding a (brighter) patterned rug on top of the carpet. I’d also have a way (white board?) to start conversations that teens can add to during the week. Open ended questions etc. (Edited for inappropriate language if necessary). YES, paint those tables. I also live to be cool – unfortunately I haven’t remotely fooled anyone into believing it yet. What about the peel-and-stick wall decals like you can buy at Target, or at craft stores? They’re removable, so you can take them down when you’re ready to switch to a new set. They have some that are Characters (my son has Mario Bros all over his room) but there are also plenty of Designs instead. It’s something like $20 for a decent-sized set, so not a huge investment to get some color on that plain white wall! Oooh, I’ve been lusting some of those, perhaps I shoudl think about them more seriously. Thanks for the reminder! 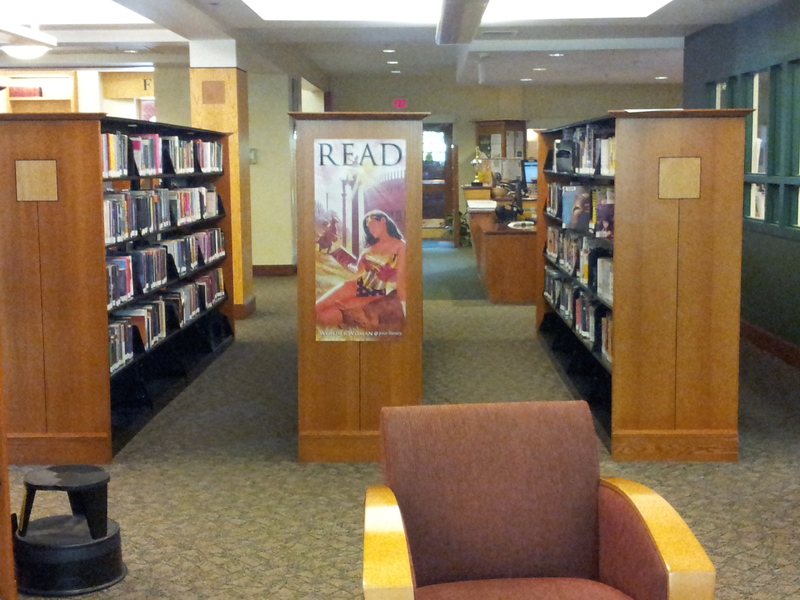 I’m thinking out loud here… and talking about Memorial Hall Library in Andover. That’s my home library & not the one I work in. At MHL there are public access computers in the teen room. Usually after school there’s a YA librarian stationed there. They feature teen art and do passive programming. And there’s a couple of white boards with messages from the librarians. Question for you: Do teens really grab a book and run or are they busy elsewhere on homework assignments and tutoring? I’d love to have computers and a desk to be in the teen space, but that’s a far off goal, I think. And yes, they do grab a book and run . . . off to somewhere else in the library to do homework or use the computers. They don’t often totally leave the building.